This India pale ale was brewed with malt that was smoked over sheep manure. This is what every beer writer has been waiting for: an IPA made with malt smoked over sheep dung. 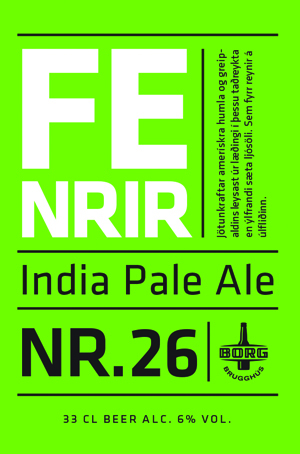 The beer comes from Iceland, a country where few trees grow and where sheep droppings are used as fuel. The beer has—surprise, surprise—a big smoky malt aroma with some citrus fruit and hop resins. Bitter hops build in the mouth with smoked malt, a slight sour note (sheep dip?) and a hint of spice. Spice builds in the finish with a tangy, smoky malt note, light hops and a dry end. It’s on sale in lots of baas in Reykjavik. Malt smoked over sheep manure? Well, let’s try to be impartial. The golden color gives no clue as to what the aroma offers, which is lots of smoky, almost burnt, grain with a little orange fruit. There’s a touch of malty sweetness up front in the taste, and some more vague orange, but this is predominantly a bitter beer, strongly smoky and phenolic, as emphasized in the lingering finish. If I didn’t know about the sheep, I would describe this as a volcano in a glass, and, as it comes from Iceland, that would seem highly appropriate.